When underdogs bite back: Renold Quinlan vs. Chris Eubank Jr.
Once-beaten Australian super middleweight Renold Quinlan 11-1 (7) knows he will be entering the ring as an unknown underdog when he steps into the square circle at the Olympia in London on February 4th in the first defence of his IBO world title against England's Chris Eubank Jr. 23-1 (18). The IBO super middleweight title fight will mark the debut of England’s ITV in the pay-per-view market. 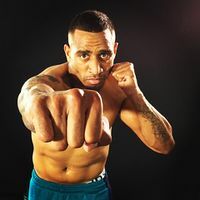 The 27-year-old from Redfern in Sydney's inner suburbs has been training for this fight in relative obscurity in a backyard gym in Kempsey on the New South Wales north coast. Each day starts with a 10km run and finishes with a total of six hours training. "A lot of people don’t know much about me," Quinlan admitted to Prime 7 Regional News in his homestate of New South Wales, Australia. "But they know after we fight. My message to that is ‘be ready for war'."